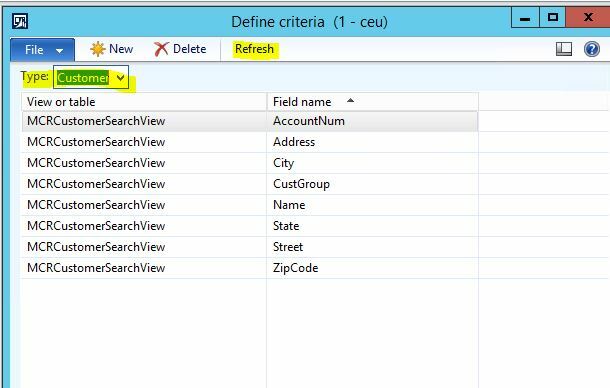 In AX 2012 R3 there is a new search feature that you can use to create sales order. With this new feature you can search based on multiple options such as Sales order, Purchase order, and phone number just to name a few. The option that will be discussed in this post is Keyword. In order to use Keywords in your search you first need to define criteria to be included as keywords. I will use the type of Customer in this example as we working with creating Sales Orders. Go to Sales and Marketing > Setup > Search and click on Define criteria. In the Type dropdown list select Customer. Once the fields are defined click the Refresh button in the menu bar. This essentially saves and activates the criteria you have defined. If you add additional criteria at a later time remember to click the Refresh button. Now that the search criteria is setup it can be used when creating Sales Orders. For example let’s say that you have criteria setup for Name and you need to create a Sales Order for a school but you cannot remember the actual name or the account number. However you do know that School is part of the name. When you click to create the Sales Order, select Keyword as the Search by and enter school in the search. The search will return results that have school in any of the fields you have defined in the search criteria. In my case Address is also set as search criteria, and since one of my Customers has School as part of the address, 2 results are displayed. At this point you can mark the record you want, click Select Customer in the menu bar and continue to create the Sales Order.